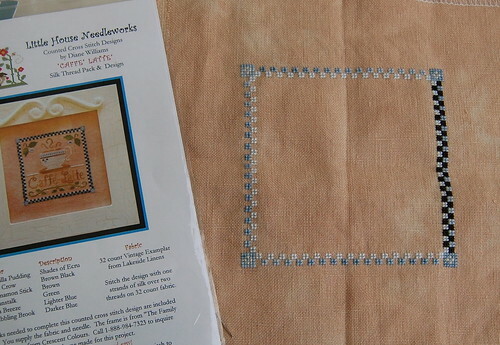 The border for Caffe Latte looks great! Your new goodies are so pretty, too. Nice start so far. Love the new charts for your stash! Love your new stash! Buttons And Pins and Where My Heart Blooms are on my wish list to get. Pitty about that thread eh? At least you made the most of your trip to your LNS - lol!!! Great stash, love the "Buttons and Pins", think that will find it's way on to my ever growing wish list. Good start on Caffe Latte. What a great border on Cafe Latte! I love cool borders. I'm working away on WHERE MY HEART BLOOMS which I adore but I'm not that over the moon for the new BB design. It's pretty but nothing like this one. Of course I'll have to get it for the Nature's Mystery chart at the end. That border is soooo cool! 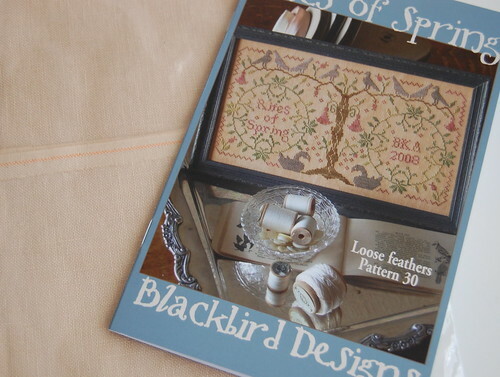 Oooh I can't wait to get Rites of Spring now I've seen a better picture of it here! It's really pretty. 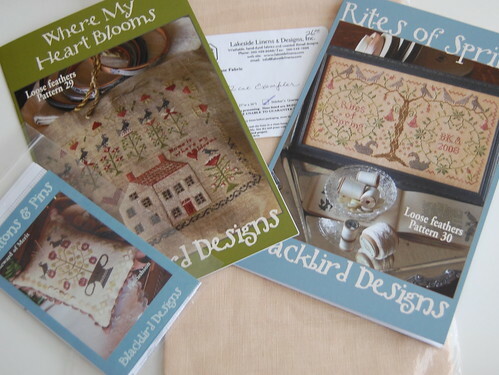 You will love stitching Where My heart Blooms. I'm close to finishing mine. Nice new start on Caffe Latte. Nice start on Caffee Latte! I'm trying to play catch up with my blog reading; it looks like you've been busy over the past couple of weeks while I've been offline! I love this border - what a cool combination of colors! I'm like you, too, isn't it impossible to go to a cross stitch store and come home with just a skein of thread?? I don't think I've ever done it ;-) Your pictures are beautiful as always! Photography class? I just registered for one at my local college and looking forward to it! New Start and New Stash! Quaker Christmas and a New Start!